The GoSmart Clip is made of plastic and is available in Red or Black. The Clip has two curved areas that hug the top and bottom edges of your 4-5″ tall smartphone. 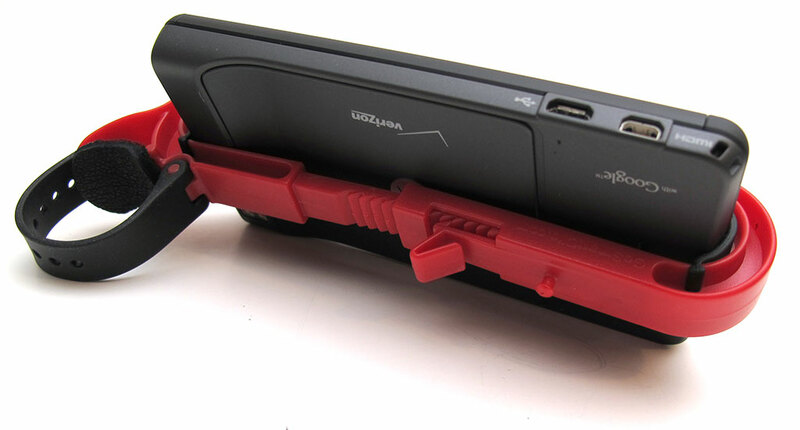 I tested the GoSmart clip with a Droid X and an iPhone 4. 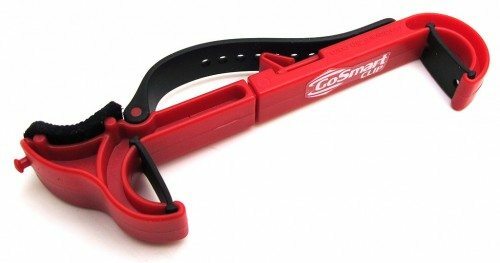 To use it, you unhook the attached rubber strap, wrap it around the 12 o’clock position of your steering wheel and latch the strap the plastic post at the top of the clip to hold it in place. 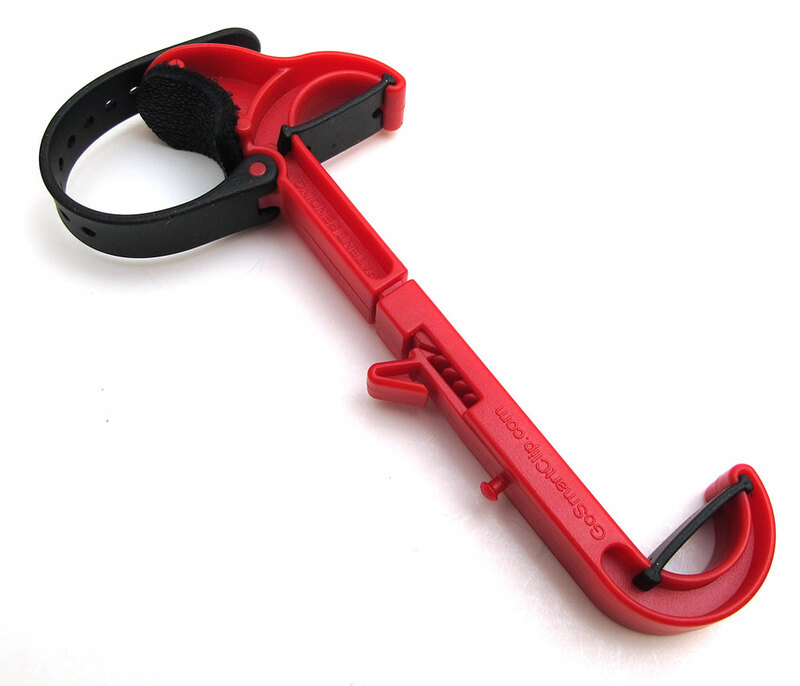 The clip can be lengthened to accommodate your phone. Here you see it with the Droid X. And here it is with an iPhone 4. 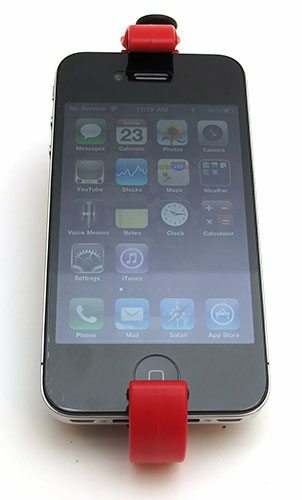 Depending on the phone that you use with this clip, it may or may not cover important buttons. The clip worked better with my iPhone, since the power button and home button were not obstructed. When used with my primary phone, the Droid X, the top part of the clip covers the power button. After attaching the GoSmart Clip to my 2006 Mazda 3’s steering wheel at the suggested 12 o’clock position, I immediately realized that it wouldn’t work well for me. In this position, the phone completely blocks my view of the speedometer. Ever since getting a speeding ticket a year ago, I tend to keep a very watchful eye on my speed. Not being able to see how fast I’m going makes me feel really uncomfortable. The FAQ on the GoSmart site says you can also place the clip in the 11 or 1 o’clock position, but I didn’t like that placement either because it felt in the way of my hands on the steering wheel. Besides the placement issue, I was also annoyed by the fact that sunlight on the phone’s display would reflect glare in my eyes while I was driving. When the phone’s display was off, I could see my own reflection in the display like a mirror. The clip would shake with the vibration of the car, which was distracting. Since the clip is only held to the steering wheel from the top, it tends to wiggle around a bit as you steer and / or drive on bumpy roads. I originally thought this holder would be a good idea to keep the phone’s display within easy view, but the more I think about it, the more I think it’s actually a bad idea. I think it might encourage or tempt people to use their phone even more while driving since it’s so easy to see. I can imagine that it would be really tempting to view and answer a text message with the phone in this position. The only advantage that I can see for using the GoSmart is for GPS usage… But I personally wouldn’t use it since it blocks the view of my speedometer and feels awkward and in the way of my hands while driving. I think I’ll just stick with keeping it in my cup holder. Still seems to me like a distraction, since it would cause you to look down all the time, say exactly lie a text from a phone. @Killerconceptz it is a big distraction both visually and physically. Just think how much easier you can watch a movie while driving! On the other hand, that might just be the thing for exercise machines. @Andy Chen – DOH! I didn’t think of that!! This would strap nicely to my treadmill. Brilliant – another dumb distraction for drivers. The article does admit the phone might block the speedometer but doesn’t say that is enough reason not to buy it. There’s no mention made of the distraction the phone will cause. Nor any mention of the fuzzy gloves, which tend to slip on steering wheels. 2 strikes against this company! Cognitive – taking your mind off what you’re doing. 16% of driving fatalities in 2009 involved driver distraction. That kind of statistic, and the purpose of this device, clash 100%. That would also suggest that the makers of this device and those who sell it could be held liable in a crash or fatality. Why does this site promote these kinds of devices? Just because somebody sends them to you? Use your head! @JWFisher Hmmm, I’m not advocating the purchase of this device. I state at the end of the review that I don’t recommend it. Why did I review it? Because that’s my job. Fuzzy gloves cause accidents? Interesting. I’ve been driving for 27 years and have never had a problem with them. I can see the phone embedding itself in the driver’s face in the event of an accident…especially if it’s propelled by an airbag. @Ken S The phone is connected to the clip, which is connected to the top of the steering wheel. My guess is that if the airbag would deploy, it would cause the clip to rotate upwards and around the steering while to which it is attached. You could stop to think about the ramifications of what you’re reviewing… this is obviously a pretty stupid thing for somebody to use. Julie: If the clip is attached only to the rim of the wheel, doesn’t this flip over (into your lap) any time you turn the wheel 180 degrees? However, I’d support Julie’s position: If such things are on the market, why not write a review and say this is a bad idea? The air bag deploys at 200-300 mph. That clip may not hold the phone. That’s like crazy stupid. During the WARM months in Minnesota, my hubby likes to eat his lunch out in his car and watch tv shows on his iPod Touch. I could see how this might be something to use while NOT driving. This is such a stupid idea from so may levels. Distracted driving, blocking view to the instrument panel, interfering with airbag deployment (not to mention becoming a projectile when the airbag deploys), interfering with steering wheel use, and finally supporting the ironically named product industry. Everyone else has said it better. It’s illegal and its dangerous. Easy to get a ticket for $200+ if not killed first. What a really dumb idea. 13. Will the GoSmart Clip interfere with the airbag if there is an accident? The GoSmart Clip is designed not to interfere with the air bag because it is attached to the top of the steering wheel away from where the air bag typically deploys. However, you should follow all local and state laws and the vehicle manufacturer’s instructions before you attach any items, including the GoSmart Clip, to your steering wheel. If you’ve ever had the misfortune of having an airbag deployed in your face, you will realize that this most certainly will interfere. You should never attach anything to your steering wheel. Even if it doesn’t drive it straight into your face, it will obviously knock it off the steering wheel, and a smartphone is the last thing you want flying around in your cabin at the moment of impact. Yes, obviously an objective and scientifically trained third party wrote the FAQ! This thing is an incredibly stupid idea, and it never should have received any attention by this website. I think its innovative !! Get into the car, clip on your phone, turn on the speaker and you are done….! I lost so many bluetooths / car devices that I decided not to buy them any more. 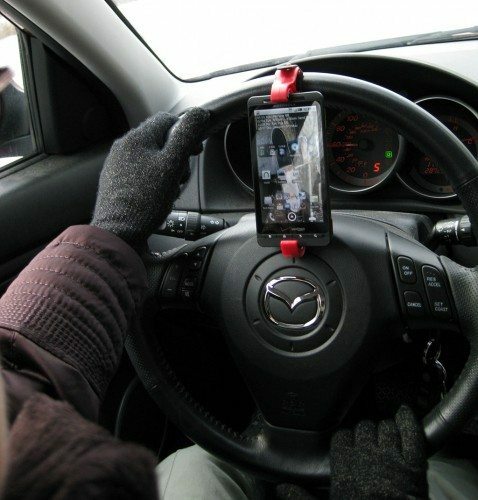 Infact I did something similar, I sticked one iphone cover to my car steering and use it my phone in the car. It doen’t come my way.. which seems to be the only problem with this go smart clip.